All done? Then on we go. Today we proceed from Nadine Dorries’ extraordinary sense of entitlement to… Nadine Dorries’ extraordinary sense of entitlement. Dorries had been seeking to shape hustings events to her advantage well before the Flitwick hustings event in May 2010. It was reported to me that she had denounced supporters of her opponents and other critics as ‘plants’ and ‘spies’ and even had alleged/imagined enemies forcibly ejected from her own private meetings (titled ‘Nadine Unscripted’; picture a hustings with only one candidate and crowd control more attuned to Nadine’s own personal needs). Typically, it was only after the departure of alleged wrongdoers that she would address any doubts about her expenses claims for what was a rental property with extraordinarily misleading and yet technically factual statements such as “I don’t even have a mortgage”. Dorries was at the time the subject of an investigation by the Parliamentary Commissioner for Standards (and then/later the police), and yet she was presenting herself as the only MP with nothing to hide. The most frustrating aspect of this was that the evidence relating to these antics came down to hearsay. By the time the matter came to my attention, Dorries had already compelled organisers to move the final hustings to a date that was more ‘convenient’ for her (i.e. too late for the local papers to cover it before the election), plus arranged for a last-minute arrival and an early departure, the latter set mere minutes before the scheduled open Q&A (what a shame). Concerned constituents wanted this final hustings event on record and made available to a wider audience, which is why they invited me to record and broadcast it. Now, I do not deny that Dorries was properly frightened when she found out I was recording the meeting, but it had nothing to do with concerns about personal safety; Dorries was watching her political career flash before her eyes and would not be a politician if she did not immediately recognise the potential cost of my recording her response to any question(s) about her expenses two days before an election at a time when many suspected – and she knew – that she was under investigation for expenses fraud. Anyone asking even the simplest of questions about this rumoured investigation would put her in a position where she would have to admit the truth on camera, or lie on camera. This is surely why Dorries left the meeting even 15 minutes earlier than her previously-arranged escape window (then stood outside chain smoking for a while before dashing off); she could not afford to be inside that building anywhere near an open Q&A session while I was recording. Thus the desperate lie that I had stalked three MPs and was under investigation for stalking Nadine Dorries at that very moment. To this day, the only evidence Dorries has presented to support this accusation was my presence at the same event where she claimed a police investigation was already underway. She still cannot produce any evidence of her even having made a complaint prior to this event. Also, more importantly, my presence at the Flitwick event is the sum total of her evidence of physical stalking. There have been other hysterical accusations aimed at other people (details of the main instance tomorrow), but these have been based on invention (if not extreme confusion), not ‘mere’ distortion. In this instance, I was actually in the presence of Nadine Dorries. Once. All of her claims of being physically stalked boil down to this one distorted account of a single event… that took place after the period when she claimed she had been harassed and physically stalked to such an extent that police gave her advice on how to avoid her stalkers (i.e. by telling lies on her website about where she was staying most nights). 1. If it were a private meeting, Dorries may have had a point about ‘gatecrashing’, but (a) gatecrashing is not stalking, and (b) it was a public meeting. One cannot gatecrash a public meeting, because you do not need an invitation to attend a public meeting, you only need to be a member of the public. 2. And besides that, I was invited! Much as she would have liked it to be, this was not Nadine Dorries’ own personal meeting; it was a meeting for the benefit of constituents, and constituents invited me. 3. 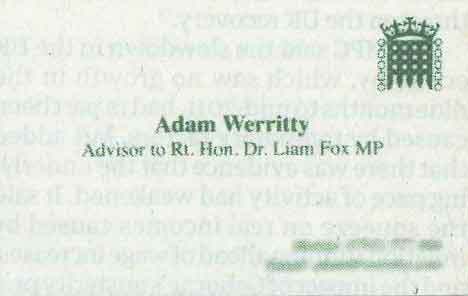 If I had lied to the Chair about being a resident, Dorries may have had the beginnings of a complaint, but I had secured authorisation ahead of time by email and explained clearly who I was (and that I was not a constituent) upon arrival. 4. Travelling by train from Guildford to Flitwick was a doddle, and comparable to a jaunt into London, which I do often. This detail is garnish, as is the “sophisticated camera equipment”, which was as follows; 1 laptop with dongle, 1 domestic digital video camera (plus tripod), 1 bog standard webcam (plus stand). Oh, and I almost forgot the cutting-edge technology used to transport electrickery to these devices; a 5m extension lead. 5. In the minutes before the event started, the broadcast camera was connected to the provider (Ustream) and recording to their server as it sat there in stand-by mode waiting for me to begin the broadcast. This is how I have a recording of me describing both the recording camera and the broadcast camera to the Chair before I sought her OK to begin the broadcast by clicking the enormous (almost playing-card-sized) button on the laptop screen that said ‘broadcast’. My agreement with the Chair was to provide the organisation that had arranged the hustings with exclusive rights to the full recording of the event captured with the high resolution camera, which would be recording alongside the broadcast. I happily offered this asset as a gesture of goodwill and a public service, and I thought it was this ‘only for us’ agreement I was (re)agreeing to when asked by the Chair if the recording was exclusively for their use. 6. Members of the audience were able to detect the broadcast because it was no bloody secret. It was widely advertised on Twitter as the Flitwick hustings event, and featured on this page listing all of the candidates. I would’ve happily announced the broadcast to the crowd, but I did not think it was my place, and I figured the Chair would mention it if she thought the crowd needed to know that they could watch a live feed of an event they were already looking at. Any idiot could find it, and it would take an even bigger idiot to think it was hidden in some way. Happily, there was just such a idiot at that meeting. I recently discovered that the woman who complained about the broadcast – who also taught me how to pronounce ‘Flitwick’ by shrieking it at the top of her voice – first complained to the policewoman present in the lobby. The policewoman did not think it warranted interrupting the meeting, so the woman stormed inside and immediately interrupted the meeting herself. Ustream documented that 234 people connected to the live stream and watched the broadcast before it was cut off in the wake of this woman’s outburst. Yes, many people used the #Dorries tag when referencing the broadcast in Twitter, including me. This happened often when she opened her mouth. It happened rather a lot after she stood up in a room full of people and accused the cameraman of stalking her. It still happens on Twitter today any time Dorries appears on radio or television. 7. Even if it is ‘slightly odd’ for a non-constituent to attend a hustings, that is the beginning and the end of Dorries’ complaint, and it doesn’t add up to anything worth a call to police, never mind a letter to the Chief Constable. I might also add that Jeremy Hunt didn’t throw a wobbly when non-constituents ‘gatecrashed’ the Godalming hustings days earlier, but I wish I’d thought to complain about the three or four other sods who turned up with better camera equipment than mine. I didn’t realise at the time I could have some of them ejected for daring to carry sophisticated equipment across county lines. On the subject of “Christopher Lee of the House of Commons Police”; Nadine Dorries is invited to explain exactly what she reported and when she did this. If she won’t do this, then I will dig the relevant data out myself and reveal the details for her. On the subject of the mobile phone number, Dorries conflates Parliamentary security with the security of a phone number that she has added to the bottom of emails to damn near every MP in the House. It is nowhere near as secure as she makes out, but I expect she engages in this charade because I did not use her phone number inappropriately* and she needs to put some kind of spin on this that is more in keeping with her ‘stalker’ narrative. If you’re wondering about my use of this number, Dorries had been dodging valid questions about her accusations of stalking and sought to pretend that she had never been notified of the vigilante element she was stirring up with those same accusations. I sought to at least alert her directly about the latter in way she could not later deny. Having learned her mobile phone number, I called it once (and once only), identified myself and asked to speak to Nadine Dorries. The staff member who answered the phone on her behalf pretended it was a wrong number. Obviously it wasn’t. I wish I’d written it on a few toilet walls now**. On the subject of the woman accused in this part of the letter; this passage is about humphreycushion. A single paragraph across two pages is the extent of Dorries’ complaint to police about her, and it amounts to precisely zero. 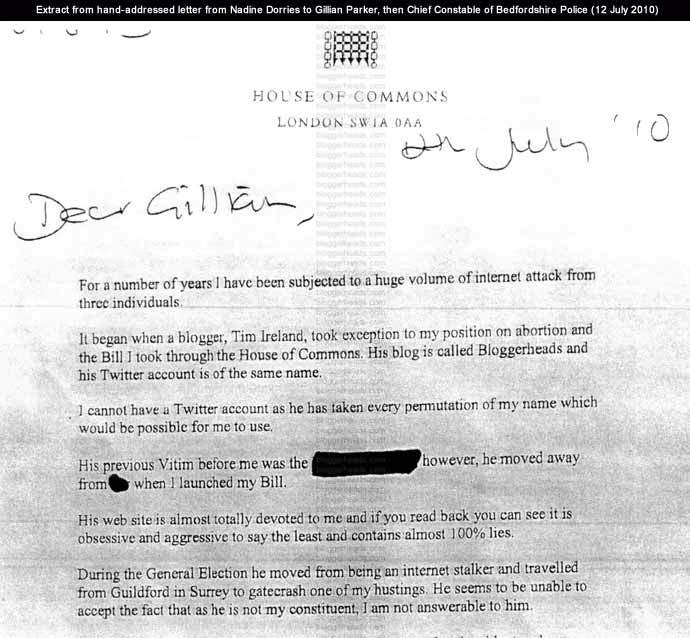 In this letter, Dorries described humphreycushion’s comments online as “aggressive and written harassment”. Police didn’t see it that way. End of, right? Well, no. Dorries decided to instead engage in a little trial-by-new-media in a pathetic hatchet job involving Paul ‘Guido Fawkes’ Staines; she smeared the poor woman, portraying her as a welfare cheat faking disability and defrauding the state. Dorries also managed to alienate many disabled people in the process; her attack on humphreycushion was based on common everyday distortions and innuendo, but these rested upon the rather unpopular assumption that if you could type, you could work. Pardon my temporary loss of composure, but it is this kind of conduct that helps me better understand why critics so often team the word ‘Tory’ with ‘scum’. Tomorrow: Part Three of the letter. Dorries accuses a third blogger of stalking and makes an entirely false accusation about them hanging around outside her house. Plus, the identity of the mysterious fourth stalker. For several years now, Nadine Dorries has been using invented and distorted accounts of her circumstances both publicly and privately to mask her corruption to and make false allegations of harassment/stalking to discredit and frustrate those who dared to investigate it. :: A series of increasingly desperate obfuscations about her expenses, primarily to do with claims made against her constituency property and payments made to a close friend & neighbour. :: Repeated attempts over the years to mask the involvement of Christian fundamentalists* in her anti-abortion campaigns – that she now pretends are ‘pro choice’ campaigns – in an ongoing mission to help this religious group lobby secretly for changes to the law that suit their agenda. When pressed for details at about this time last year, Nadine Dorries claimed to have reported four stalkers** to police and eventually named me as the ‘worst’ stalker, if not the ‘leader’ of a gang of stalkers (sometimes extending to all of Twitter). Now, this is not an easy or pleasant accusation to endure in the best of circumstances, and I’ve experienced the added joy of having to deal with a vigilante element that Dorries was knowingly stirring up, but this situation has put me in a unique position that allows me to establish the truth, and clear everyone who has been accused of stalking this MP. In October 2010 Nadine Dorries told the public that she lied on her blog about the amount of time she had spent in her constituency not in order to deceive her constituents/association about her level of commitment to the area (as she told the Parliamentary Commissioner for Standards) but instead because – she claims – she was specifically advised by police to tell little white lies about her whereabouts in order to throw physical stalkers off the scent (more). This was a complete lie. Nadine Dorries has no history of being physically or even electronically stalked, ever. Instead, it has been confirmed by Bedfordshire Police that Dorries uses the word ‘stalker’ to describe bloggers and other critics. And from here, I’m going to let Dorries herself repeatedly confirm that same point for me. 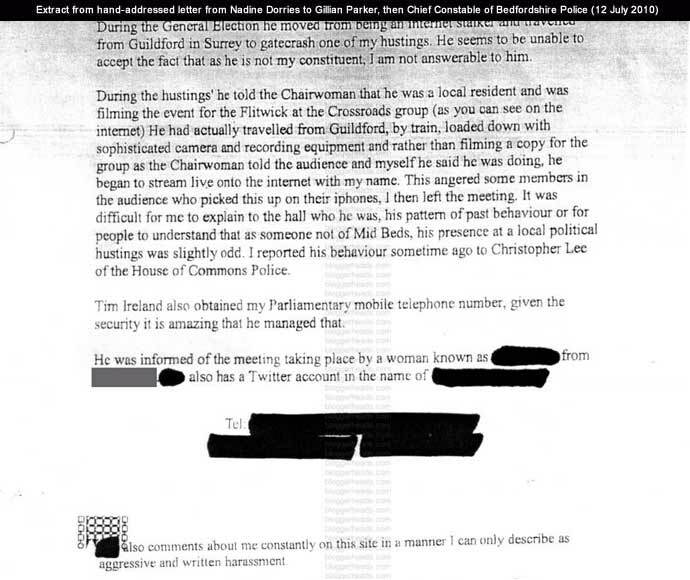 The following is an extract from what appears to be the first complaint by Dorries to local police about any stalking threat; a letter Nadine Dorries hand-addressed to the Chief Constable (!) of Bedfordshire Police in July 2010, a couple of months after the hustings meeting at Flitwick where she told the audience an investigation into her stalker(s) was already in progress. I have obtained this letter and other documentation from Bedfordshire Police through a subject access request under the Data Protection Act. There is further data to come from the London Metropolitan Police. I made a similar request to the Parliamentary office of Nadine Dorries, but she has defied the ICO on the matter, and portrayed my data request as vexatious and a waste of time. She does this while claiming to hold “vile, abusive messages” from me that she won’t show anyone, not even me. There are only a few documents of key relevance, but there’s a lot in them, so please excuse my addressing some if not all of these documents in parts. 1. It is true that Dorries first earned my attention while expressing her opinion on abortion. I watched her make a false accusation against a critic right before she claimed a 21-week-old foetus had punched its way out of a womb and misled Parliament alongside her secretive associate Andrea Williams. I dared to blog about such events. Shocking, isn’t it? 2. I have ONE account in the name of ‘Nadine Dorries’, and Dorries knows this. 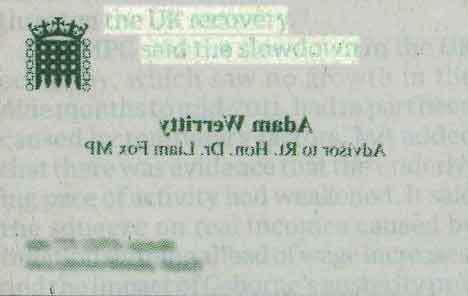 She has also seen this confirmed by authors of the other accounts using her name for a range of satirical vehicles. She also knows my and their use of this account name (and her name) is entirely legitimate. Even today she pretends it’s something it isn’t so she can present it as something that is not legitimate, and perhaps illegal. 3. I will write about the other ‘Vitim’ at a later date, but Dorries is having herself on here. 4. Having been accused of stalking by Dorries at a public event, I blogged about it and tried to get to the bottom of her claims that I had stalked others, that I had sent her “vile, abusive messages”, and that a police investigation was in progress. Even then my blog was not ‘dedicated’ to her and I invite you to judge this for yourself; May 2010, June 2010, July 2010. Sadly, this letter is not an isolated example of Dorries misrepresenting a reaction to an accusation of stalking as evidence of stalking. 5. I reject any suggestion that what I write is “almost 100% lies” or lies in any way. Dorries is playing the same tired old game used by Iain Dale; accuse your opponent of lying/libel, and when asked for evidence, wave a hand in the general direction of their website. I work assiduously to be accurate, and even if you want to cast me as unfair or incorrect, at least you have the opportunity to inspect the evidence and subject it (and me) to scrutiny. Not so with Dorries. She rarely portrays evidence accurately on the odd occasions she relies on any, and she shuns scrutiny to such an extent that she’s left Twitter in a huff twice now, and disallowed comments on her ‘blog’ since 2008. The accusation of lying is especially insulting from someone who admits to using “70% fiction” on her ‘blog’ before changing her story and claiming she meant 30% fiction, and then changing her story again to say that she really meant no fiction at all, if one didn’t count the special lies she says the police advised her to publish to avoid the imaginary stalkers. FFS, even at this relatively early stage she was already telling lies to cover up the lies about the lies she told. 6. It is clear from this letter that Nadine Dorries defines my conduct towards her from March 2008 up until May 2010 as a criminal act she describes as “internet stalking”. I not only reject this, I can easily show that the police rejected it, and that Dorries doesn’t have a leg to stand on legally or morally. I can’t say more than ‘more to come’ right now without ruining any of the lovely surprises in store. 7. Let us assume for a brief moment that Dorries has a point about my not being a constituent; she has endorsed a harsher web campaign against a personal/political opponent based on little besides malice and run by an associate of hers who was not a constituent of the MP concerned. “He’s not a constituent” doesn’t hold water even if you accept the weak argument behind it. 8. Who does she think she’s kidding with this ‘not a constituent’ nonsense anyway? All MPs are answerable to the electorate as a whole, especially when it comes to issues of conduct, and definitely when they campaign on the national stage and lobby to change laws as Dorries does. The accounts of physical stalking I will address in upcoming posts, but the short version should hold you for now; no stalking took place at any time, and Dorries is imagining things where she is not making stuff up. Dorries isn’t being internet-stalked or huge-attacked or death-threated or anything like that. She is just an extraordinarily self-important liar who has been digging a deeper and deeper hole for herself. 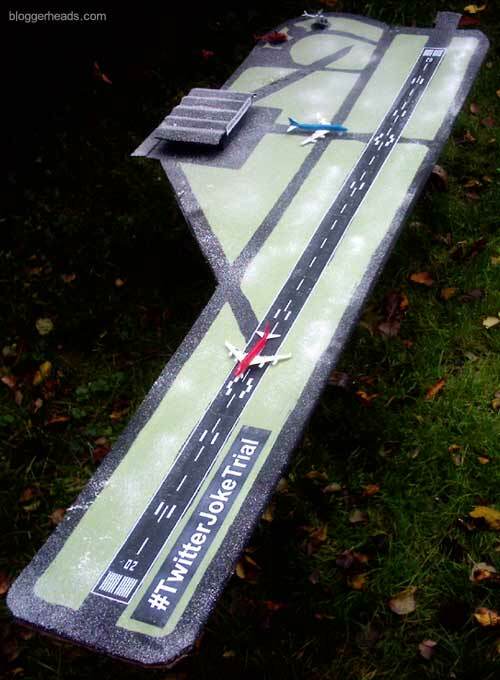 Tonight, I am burning Robin Hood Airport in effigy. There’s no need to call the police for reasons that should be obvious. Cheers all. Have a safe Guy Fawkes night, and please try to avoid barbecuing any hedgehogs. UPDATE (11pm) – Got some video for you, folks. Morning, folks. I have decided to email Nick Pisa about his conduct last night, when through the Daily Mail he reported how a series of people reacted to an event that never happened. Do you have any response to the evidence that you and relevant Daily Mail staff were prepared to go to print with [an] entirely invented accounts of events, reactions and statements that you could not possibly have witnessed? “Oh, do calm down; EVERYBODY does it,” said a clearly emotional Pisa before calling his critics names and running away. If you would prefer me to report something you actually said, rather than what I expected you to say, then please do get in touch. I’ve already received a genuine response while preparing this post, and I look forward to publishing it shortly. UPDATE – Nick Pisa is now suggesting that I contact the Daily Mail for a response (on the basis that they published what he imagined) but for the record, this is a summary of what he had to say for himself about the above. These are key extracts from a wider email conversation, but if Nick is worried about being quoted out of context, I would be delighted to publish the entire exchange if he so requests. Confusion over the judge’s announcement meant Sky News and several news websites, including Mail Online, briefly reported incorrectly that Knox had been found guilty. This was corrected just over a minute later when it became apparent that he had said she was guilty of slander before going on to say both Knox and Sollecito were innocent of Meredith’s murder. We apologise for the error and have launched an enquiry to examine our procedures. It is common practice among newspapers to prepare two versions of an article ahead of a court verdict and these are known as ‘set and hold’ pieces. We would like to make it clear that Nick Pisa had no involvement in the decision to publish his set and hold piece on MailOnline. The quotes were obtained from various parties in the event of either a guilty or not guilty verdict. … but if this is the case, it makes no sense for these accounts of reactions to a verdict to be in a ‘set and hold’ piece, because the writer would at the time have been responding thinking he had a verdict. UPDATE (06 Oct) – I urge you to read the unfolding comments, and when a clearer picture emerges I expect to update the body of this post with any crucial elements (i.e. instead of deleting it and pretending it never happened, as some tabloids are wont to do). At this time, it appears entirely possible that Nick Pisa at least acted in good faith, and with some rigour, though we may not see any relevant details until after the Daily Mail have conducted their internal investigation. Scare quotes from ‘journalist’ in my headline have subsequently been snipped to remove the likelihood of the man being judged by this alone. In other news, it is 5 years to the day since I wrote the original article. Happy birthday, lil’ article. This latest outburst from Nadine Dorries is a textbook attempt by this MP to spoil a major revelation/disclosure that she knows is coming. This is complete lie that Dorries repeatedly publishes and broadcasts knowing exactly how it sets off an active vigilante element; primarily, people who have their own reasons to intimidate me into silence, but are visibly agitated by Dorries’ outbursts. This leads me to the main reason why I have not yet published the damning evidence that I have mentioned. A man who I will not name was so caught up in Dorries’ late-May ‘caution’ lies that he made his own complaint to police in the days that followed, called on others to do the same, and then made a threat of violence against me and another man on his own site, under his own name, on the same day he had an appointment with police to discuss his (false) allegations. Police have not acted on any previous complaint from this man, and they did not act on this latest complaint. But they did take the threat of violence seriously, which is what has led to the scheduled court appearance* that makes it very difficult for me to expose Dorries as a liar without risk of prejudicing an upcoming trial. However, as a sign of good faith to the lovely readers and followers who continue to stand by me, I am today publishing the worst thing that police report says about me. Some of the report impacts on others, so it may not be published by me in its complete (albeit redacted) form, so I just wanted to be clear with folks that I am not hiding anything. That, and I’m curious to see the mountain Dorries will build out of this molehill while I wait to drop a shedload of bedrock on her. I am currently in the process of researching the relevant officer’s account so I might better understand how they came to this conclusion, but if my memory serves me well, this negative impression most likely stems from my mentioning it was Dorries who was actually under investigation for expenses (which was true) when she claimed I was under investigation for stalking (which was not true). I am happy to discuss this in comments, but little else, for reasons I would hope are clear. I will blog again as soon as I am able. In the meantime, you can find me on Twitter most weekdays. Do follow me, even if only to annoy the biggest liar Parliament. *UPDATE (09 Nov) – I have been advised that the CPS have discontinued this case mere days ahead of the scheduled court date, so I’ll most likely be going live with the Dorries evidence within the next week. Holy cow! It looks like News of the World ‘hacked’ the phone(s) of Brad Pitt, Angelina Jolie, and/or Jennifer Aniston! 1. As I have already noted, if we are to hope to hold News Corporation to account for the conduct of newspapers operating under subsidiary News International, then what we need are victims of phone ‘hacking’ who are US citizens (or even, at this stage, US citizens who are potential victims). Given the enormous monetary/legal resources Rupert Murdoch has and the political influence he retains despite this massive scandal, it is preferable that these victims have ample resources and access to legal Rottweilers. So, if you’ll pardon the arrogance of my onomatopoeia; Boom. 2. Speaking of legal Rottweilers, I have already written about the pattern of celebrity stories that claim to be based on leaks from ‘friends’, but appear instead to have been based on illicitly-accessed phone messages, but I think News of the World would have been far more wary of basing a scoop solely/obviously on Brangelina’s phone messages than they would have been with your average citizen (and with good reason; the couple sued the newspaper over a later article in 2010). I suspect News of the World staff/editors retained most of what they discovered through this route and did not publish the usual level of detail until after the Pitt/Aniston break-up was public knowledge and there were enough actual blabbers around (i.e. in the bitter dispute that followed) to provide adequate cover. I expect I’ll know more once I get my hands on that October 2004 item mentioned in this article. 3. Look at the detail. The source News of the World rely on here appears to know a lot about the tone of voice people used in these intimate phone conversations. This does not look good for News of the World. This does not look good at all. 4. Like the Danielle Jones article, this item is not only prominent (Page 9), it makes specific reference to phones. We are expected to believe that then-editor Andy Coulson somehow missed this or looked at this item (knowing the pronounced risks of litigation) and did not make any enquiries about the source. 5. Hell, if you’re the speculating type, try to imagine Glenn Mulcaire listening in to this break-up of a leading celebrity couple, and then try to guess who he might speak to about this dynamite story. Personally, if I were a greedy tabloid scumbag, I’d be talking directly to the editor if not passing on messages about how many extra zeroes this one would cost. Cheers all. If there’s enough money in the kitty by early this afternoon, I can start making immediate plans for another jaunt into the British Newspaper Library early next week.